There are not very many salads I can get away with serving for dinner. I think I've mentioned that my husband is a meat and potato man. So salad with dinner is OK, but salad as dinner...that's a whole different story. This salad however, passes the husband test. Mainly because it's loaded with steak. But it also happens to be healthy and really filling. Feel fee to mix it up with the veggies you would prefer. The key to the salad is the balsamic steak mixed with the Gorgonzola and arugula. 12 oz. should serve about 4 people. 1. In a large skilled heat oil. Sear the flank steak on high heat for 2-3 minutes. 2. Add balsamic vinegar and mustard. Stir and continue to cook until steak is cooked and vinegar has reduced into a syrup. 3. Toss salad mix with tomatoes, cucumbers, olives and celery. 4. 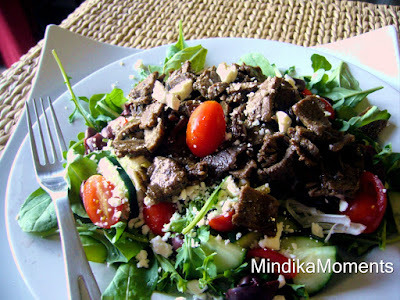 Top salad with balsamic steak and Gorgonzola cheese. 5. Drizzle with a little olive oil and a squeeze of fresh lemon juice. I don't think I've ever had steak salad. Yours looks delicious!